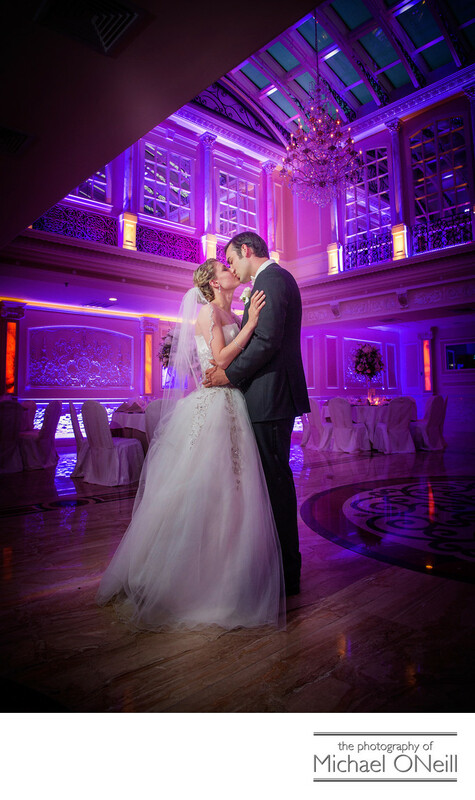 Jericho Terrace in Mineola, New York is one of Nassau County’s most popular wedding reception venues. That should come as no surprise as it features some of the most beautifully decorated contemporary rooms anywhere. This picture was taken in The Skylight Terrace room which features a huge skylight, built in LED uplighting and built in flat screen televisions. Down the hall you will find The Dome Room...equally as beautiful and dramatic. Elsewhere on this web site you will find pictures of The Dome Room as well as other photographs taken in the elegant lobby and outdoors in the magnificent gardens with it’s integral waterfall. Clearly Jericho Terrace is a wedding photographer’s dream with stunning backdrops almost everywhere you look. Bridal portraits, family photographs, pictures of you and your bridal party; it can all be done, and done beautifully, right on site. If you are planning a Jericho Terrace wedding give me a call. I have much experience working at this phenomenal venue.